A TERRORIST only needs to be lucky once, goes the adage. Their targets need to be lucky every time. That is only partly true. The most serious terrorist plots are meticulous operations. They often involve years of planning. And with the knowledge that their secret network will probably be uncovered whether they succeed or not, their masterminds prefer not to take unnecessary risks. They like to know that the odds are stacked in their favour. So what represents an acceptable risk for potential attackers? A 50% chance of success? That is far too high. Even 75% would probably make a terrorist cell shirk. How about 96%? That sounds a bit more like it. This should worry passengers travelling through American airports. 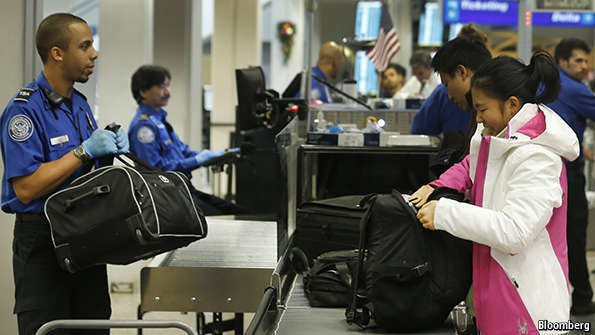 A report from ABC News, an American television network suggest that, in a test by the country’s Transportation Security Administration (TSA), agents were able to smuggle fake bombs and firearms through airport security on 67 out of 70 occasions—or 96% of time. The details have not being released, but the shoddy nature of the screening process has already cost Melvin Carraway, the acting administrator of the TSA, his job. The numbers in these reports never look good out of context but they are a critical element in the continual evolution of our aviation security. We take these findings very seriously in our continued effort to test, measure and enhance our capabilities and techniques as threats evolve. better checked baggage screening equipment and another $ 11m for training since a previous review in 2009, the TSA failed to make any noticeable improvements in that time. On the other hand, it is probably not in a country’s interest to let potential attackers know that, should they wish to chance their arms, they stand a good chance of success. Screening will never be foolproof. But the minimum requirement should be that the odds are in the targets’ favour.